Our experienced staff will be happy to provide you with suggested riding itineraries, whether a half-day ride around Amsterdam or a extended tour of the Dutch countryside. City tour or Architecture tour 26,50 we can offer customized tours. Parking 24 hours for 10,-. To see and sample the most delicious herring, the tastiest Amsterdam smoked ossenwurst; the finest cheese and jenever and the most original Amsterdam pickles and beer. 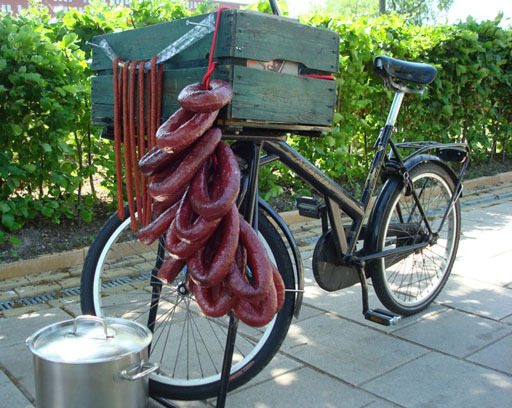 Worldchampion cooking performer Fredie Beckmans will take you on a bicycletour to taste these local delicacies. Urban growers Sameena, Henriette or Eva from the Cityplot Urban Farming collective will take you on a journey visiting Amsterdam's urban farming hotspots and eateries featuring local and sustainably-produced food. We can do some guerilla gardening along the route, and you can request home-made seasonal snacks from local produce and drinks or even cocktails! At the end of the tour we can also visit a special cafe garden where you can enjoy locally-grown snacks and drinks. Very experienced and guaranteed for the best tours. Guide to International Bike Hire & Cycling Tour Operators.